Learn to climb safely and confidently with this information-packed guide, shown in 240 photographs. It covers a range of different climbing environments, from indoor walls and simple rocks to sea cliffs. It explains how to climb overhanging rock, chimneys and corners, and how to avoid the most common mistakes. 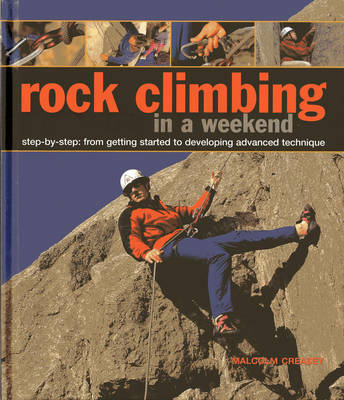 It features step-by-step photographs throughout the book that clearly illustrate perfect rock climbing positioning and technique. It includes essential safety tips and guidance throughout. It features an illustrated guide to the best type of clothing to wear, and explains the basic equipment required. It is targeted at complete beginners, but with variations and advanced techniques for the more adventurous climber. Rock climbing is one of the fastest growing sports in the world. The physical and mental challenge has much appeal and makes climbing the ideal pursuit for anyone seeking fun, adventure and an enhanced level of fitness. Designed as a lead-in to the sport or to complement a professional training course, this essential guide covers all the techniques and safety factors in step-by-step detail. This book progresses from the first moves a climber makes on the indoor wall to some of the most common challenges to be faced, from basic bouldering to climbing crags and corners, and abseiling. Each section features a photograph showing the perfect way to tackle the climb, with annotations pointing out all the important things you need to be aware of when on the wall or rock.